The cottage Ophelia is a cottage of 60m² for 3 to 4 people located on the first floor, in the attic of the wine cellar ZEYSSOLFF. It has an electric heating individual. 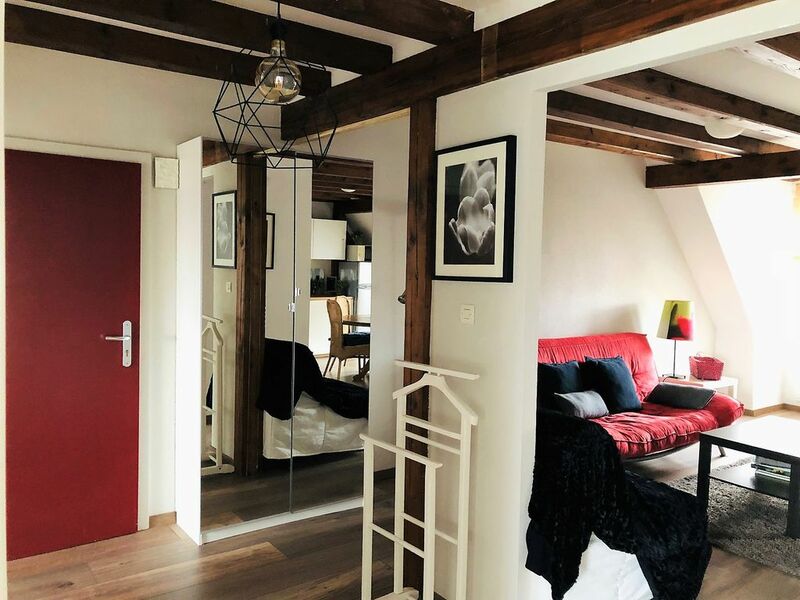 Its exposed beams combined with its red tones make this apartment an authentic and modern cottage. It has a small entrance with a large closet. A living room with TV, DVD player and sofa invite you to relax. An equipped kitchen area is at your disposal. 2 independent bedrooms are composed of one of a large bed and the other of a single bed + sofa 1 place if need. A bathroom with shower and toilet. Electric heating included, charges and taxes included. Free WIFI. Non-smoking cottage. No pets. Sofa, TV with DVD player, 1 round table and 4 chairs. 4 induction hobs, oven, microwave, fridge, freezer, toaster, coffee maker, kettle, raclette and dishes. Shower, single washbasin with cupboard, toilet. TV-flat screen, DVD player, TNT, fan and vacuum cleaner. In Barr, 2 kms away, you will find the manor's restaurant with its Alsatian dishes as well as the sun restaurant in Valff. Sheets provided with 3 beds and beds made on arrival. Bath mat and kitchen towel provided. Cleaning not included in the price (60 €), optional baby kit (bath, high chair and cot) (10 € per week), Towels (1 bath towel, 1 towel and 1 washcloth) optional : 5 € the week. Extra bed and sheets on request and extra. A lingerie common to all the gites is at your disposal free of charge, in which you will find a washing machine, a tumble dryer, drying clothes, a table and an iron, outdoor games (rackets, bowling ...) for kids. Superbe gîte. Cosy, agréable, joliment décoré. Gîte que nous recommandons. Sympathie des propriétaires. Très bon accueil. Un gîte agréablement aménagé. Nous avons apprécié notre séjour. Nous gardons soigneusement ses références. Si nous venons à revenir dans la région sans aucun doute nous y reviendrons. Nous avons passés une excellente semaine en Alsace,le gite était agréable,un peu chaud,( vu la semaine de canicule que nous avons eu !!). Les propriétaires très aimables et super accueillants...Nous reviendrons avec plaisir.Merci beaucoup encore.Fabienne.